The Sole Fitness SB700 Exercise Bike is a well-built, solid bike that offers extreme comfort and smooth performance to the user. 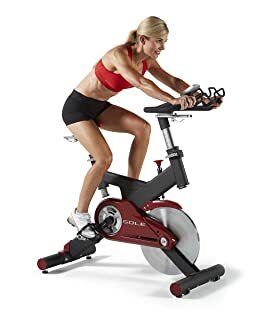 It expediently qualifies as an indoor bike; however, you get the same experience as outdoor cycling due to the fact that it is a spin bike. All in all, it is a fairly feature-packed bike that allows you to perform intense cardio workouts. Even though it does not come with any workout programs, you can still intensify your exercises through resistance levels. The Sole SB700 has been incorporated with a battery-operated LCD console that shows RPM, distance traveled, speed, time, and kilocalories burned. This console is also compatible with a wireless chest strap that monitors your heart rate so that you can stay within your Target Heart Rate zone. It also features a blue backlit screen so that you can easily see the readouts while you work out. Constructed from 2mm of oval steel tubing and accompanied with an aluminum shroud, the Sole Fitness SB700 Exercise Bike seems highly durable and stable. However, this indoor cycle is still pretty lightweight and allows easy portability. The resistance levels are supposed to be adjusted via the provided tension knob. It uses a Kevlar braking system featuring brake pads that are well-aligned with 48 pounds of the chrome-plated flywheel. 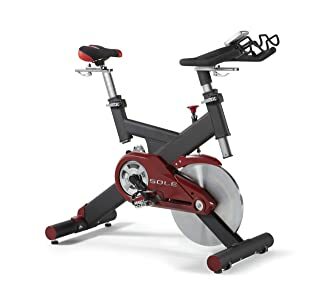 It is the fixed, balanced commercial quality of the flywheel that provides exceptionally smooth and quiet performance, which is why this bike is perfect for a home workout. The ergonomically designed saddle allows pedaling for a long period of time without causing quick fatigue. This padded seat and handlebar can be adjusted in up/down as well as fore/aft directions, thus providing the utmost comfort to users of different heights. The Sole Fitness SB700 Exercise Bike comes pretty much pre-assembled and demands very little assembly from the user. The whole assembling process may take about 20 minutes. All the necessary step-by-step instructions and tools come included with the product. The Sole Fitness SB700 Exercise Bike’s flywheel is designed to be heavyweight and smooth. The felt pad resistance braking system is reliable and quiet to operate. Hence, it is a perfect workout gear for residential as well as light-duty commercial use. The comfortable padded seat and handlebar can be adjusted in fore/aft as well as up/down directions. Hence, different heights of users can easily find their most comfortable position on this bike. Even though the Sole Fitness SB700 does not come with any pre-set workout programs, it still displays various workout metrics like distance, RPM, speed, time and kcals burned. This console has a blue backlit screen so that you can see the readouts effortlessly. Constructed from strong oval-shaped steel tubing, this bike certainly might offer high durability to the users. This sturdy frame is further shrouded with aluminum to make it fairly lightweight and easy to maneuver. It is somewhat pricier than other competitive bike models like the Phoenix 98623 Revolution Cycle Pro II. It does not come with any sort of predetermined workout programs. It does not come with other additional accessories like a fan, chamber speakers, or data transfer functionality. There are no markings provided on the tension knob, so you can get confused as to which resistance level you have set. The Sole Fitness SB700 is a robust, heavy-duty exercise bike deliberately designed for both indoor as well as outdoor cyclists. 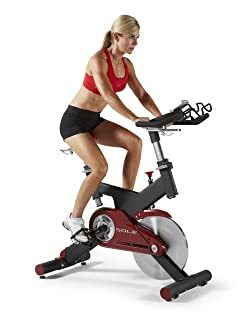 Those of you who want a solid workout platform without any additional accessories like a fan or entertainment speakers can definitely opt for this bike. It is a high-end bike model that allows you to perform lower body as well as cardiovascular workouts to tone and strengthen your muscles. Not only well-built, this bike is aesthetically designed with sleek and vibrant red-black accents to add a hint of style to your settings.